Sam Hinkie has stepped down as the Philadelphia 76ers' general manager and president of basketball operations, nearly three years after taking the reins of the organization and embarking on an unprecedented campaign of rebuilding through the NBA draft lottery that, thus far, has produced only one of the worst on-court runs in league history. Under Hinkie's tenure, the 76ers have amassed an NBA-worst record of 47-195 since the 2013-14 season, winning fewer than 20 games in each of his three years on the job. Two seasons ago, the 76ers tied an NBA record for consecutive losses at 26 in a row. 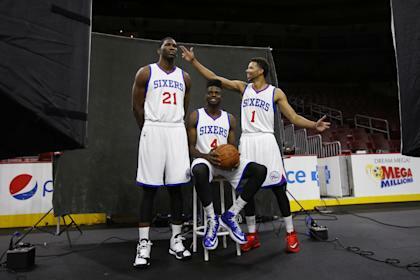 This season, the 76ers tied an NBA record for consecutive losses to start a campaign, opening up 0-18. Do you care about 9-73? Hinkie: "For sure. I lost 20 pounds from November to January." Lowe: "Did you really? From stress?" Hinkie: "Yes. It's not close. This is serious for our fans, our staff, our players, you want to perform, you want to meet expectations and you want to play well. And you want to deliver and tamp down all the noise that comes with a record or a streak or those kinds of things, because they're not productive to some larger mission." All the losing, and the annual lottery trips that came with it, were part of what has come to be defined (and derided) as "The Process" — an overarching approach to roster-building in which Hinkie prepared the 76ers to lose as many games as possible in an attempt to snag high-upside, cost-controlled young talent at the top of the draft. He favored stockpiling second-round picks and trying to entice them to sign three- and four-year deals at or near the league minimum salary, with the latter seasons unguaranteed, in hopes of finding the next Chandler Parsons. He also liked continually churning through undrafted free agents, D-League players and international prospects, taking as many low-cost shots at finding future contributors as he could. By employing almost exclusively young, inexpensive and inexperienced players, the 76ers maintained one of the league's lowest team salaries. That allowed them to have plenty of cap space to serve as a facilitator in other teams' deals — we'll take on some salary you don't want to carry, so long as you pay us off in future draft considerations — without seriously bolstering the existing roster and endangering the likelihood of losing enough to get the highest possible odds of landing the No. 1 pick in the draft, thus finding the sort of transformational superstar that teams must land to compete for championships. Alas, the 76ers never picked first in Hinkie's tenure. Eventually, all that losing — and the out-in-the-open nature of the whole operation, undertaken without any concern for how it might look, which triggered the great "tanking" panic of recent years — wore thin with the NBA's other 29 owners. They tried (and failed) to institute lottery reform in the wake of the Sixers' sink to the bottom, and reportedly lobbied NBA Commissioner Adam Silver to "step in with regard to the direction" of the franchise. Last December, Sixers managing general partner Josh Harris heeded the call, adding NBA lifer Jerry Colangelo — Naismith Memorial Basketball Hall of Famer, longtime former Phoenix Suns executive and owner, and the chairman of USA Basketball — to Philly's front office as "special advisor to the managing general partner and chairman of basketball operations." Colangelo's arrival was widely seen as a move to usurp Hinkie's authority as the franchise's top basketball decision-maker, introducing uncertainty into both the status of Hinkie's "Process" and his position in Philadelphia's hierarchy. In a 13-page letter to members of the Sixers' ownership group, obtained by ESPN.com, Hinkie wrote: "There has been much criticism of our approach. There will be more. A competitive league like the NBA necessitates a zig while our competitors comfortably zag. We often chose not to defend ourselves against much of the criticism, largely in an effort to stay true to the ideal of having the longest view in the room. "... Given all the changes to our organization, I no longer have the confidence that I can make good decisions on behalf of investors in the Sixers — you. So I should step down. And I have." "While we are disappointed in Sam's decision, we would like to sincerely thank him for his contributions over the past three seasons." Harris said in a statement. "There is no question that Sam's work has put us in a very strong position to take advantage of numerous opportunities for an exciting future." Bryan Colangelo, former two-time Executive of the Year and son of 76ers chairman Jerry Colangelo, will take over as the Sixers' general manager, according to Adrian Wojnarowski of The Vertical. Hinkie spent seven years with the Houston Rockets, during which he became the youngest team vice president in NBA history, one of the league's most expert managers of the salary cap and navigators of the collective bargaining agreement, and the chief lieutenant of general manager Daryl Morey, helping popularize the use of advanced analytics in basketball decision-making. He joined the 76ers in May of 2013, with Philadelphia coming off a disappointing 34-48 campaign, capping a decade in which they won between 33 and 43 games in nine of 10 seasons and never advanced beyond the second round of the playoffs. The Sixers had taken a big swing for the fences, taking part in a four-team deal that sent Dwight Howard to the Los Angeles Lakers, Andre Iguodala to the Denver Nuggets, multiple picks and young players to the Orlando Magic and Andrew Bynum to Philadelphia. That didn't work out so hot for Philly. A new direction was needed. The "private equity princes" who had purchased the Sixers in 2011 for $280 million were looking for a different and better path forward, one that would help them escape the treadmill of mediocrity and move into a future in which the franchise could compete for its first championship since 1983. 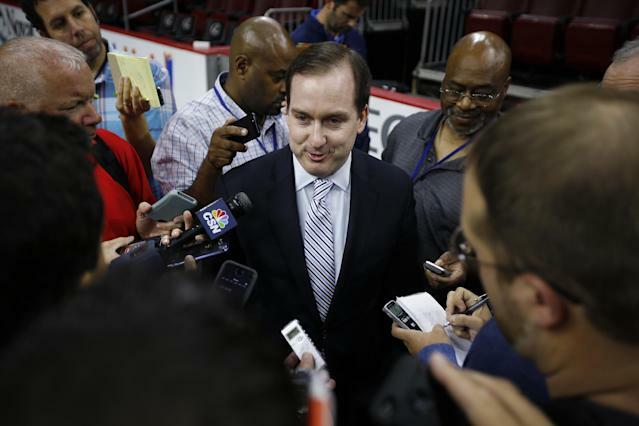 Hinkie, a product of the Stanford Graduate School of Business and Bain Capital fluent in their language, had just come off helping construct one of the league's longest-term plans to net a star — the Rockets' years-long, transaction-filled collection of the assets necessary to entice the Oklahoma City Thunder into a deal for James Harden, a Sixth Man of the Year who yearned for the opportunity to become a superstar and the maximum-salary paycheck to match. Given the keys to Philly's operation, Hinkie set about duplicating that success by seeking one of the league's rarest and most valuable commodities: a bona fide superstar on a rookie contract. "I think sort of the big message was ... The crops have been eaten," Hinkie told Lowe. "The future ability to nourish yourself was impaired, and so you're a long way away, and how do you do that?" Hinkie also drafted Syracuse point guard Michael Carter-Williams, who would take advantage of getting all the minutes he could handle as the lead ball-handler playing at the 76ers' breakneck pace under well-regarded former San Antonio Spurs assistant Brett Brown. Carter-Williams averaged more than 16 points, six rebounds and six assists per game en route to winning Rookie of the Year honors. At the following trade deadline, Hinkie flipped him to the Milwaukee Bucks in a three-team swap that landed Philadelphia the rights to a Los Angeles Lakers first-round pick protected for the top five spots in the 2015 draft (the Lakers kept it), the top three picks in 2016 and '17, and completely unprotected in 2018. He offloaded veterans like Spencer Hawes, Lavoy Allen, Evan Turner and Thaddeus Young for future first- and second-round picks, and kept a steady diet of D-Leaguers on 10-day contracts coursing through the back half of Brown's roster. After missing out on the top two picks in the 2014 draft, Hinkie used the No. 3 selection on Kansas center Joel Embiid, another gifted 7-footer who likely would have been in the running for No. 1 overall ... had he not suffered a stress fracture in his back and a stress fracture in the navicular bone in his right foot. Hinkie also chose rangy Louisiana-Lafayette point guard Elfrid Payton, only to flip him to the Orlando Magic in exchange for the rights to Croatian forward Dario Saric and a 2017 first-round pick. Neither Embiid nor Saric has yet suited up for the Sixers; Embiid is still rehabilitating after a second foot surgery that cost him a second straight season, while Saric continues to play in Turkey ahead of an anticipated arrival in Philadelphia this coming offseason. He turned one of his second-round successes, dynamic swingman K.J. McDaniels, into small shooting point guard Isaiah Canaan and another future second-round pick that may or may not become something. He once again wound up with the third overall pick in the draft, and selected Duke's Jahlil Okafor — another center, for the third straight year, although this one was healthy enough to play off the bat ... if not necessarily ready to play with Noel, as the two proved an awkward fit from the jump and continued to be one until an injury forced the end of Okafor's rookie season. After three years, 161 transactions and roster moves (according to Basketball-Reference.com's database), 99 different players (all of whom appear on this handsome T-shirt) and 195 losses — the 76ers still didn't look like an actual NBA team. At the end of it all, really, there's no end of it all. There are Noel and Okafor, who have a long way to go to be able to be a frontcourt pairing that wins things. There are Robert Covington and Jerami Grant, who are pretty good, and Hollis Thompson, who can shoot 3s. There's the hope that Embiid can ever actually get the court, and the prayer that Saric can be the straw that stirs the drink. There's the promise that this summer the Sixers were really going to spend in free agency this summer, and an advanced analytics infrastucture tracking everything from biometric data to proprietary measurements of "effort" to every shot a Sixer takes in shootarounds and practices. There are a whole bunch of lottery tickets, with as many as four first-round picks coming this summer and as many as 10 second-round draft picks between now and 2021. "Losing breeds losing," Jerry Colangelo said Monday. "I mean, that's just the reality. When you're around a team that falls into that kind of funk, it's hard. The best thing is, get it over with. It's almost over. That's what I keep suggesting to Coach Brown and Sam and everyone else. Let's finish this thing off. ... Let's bury it and don't look back. Just look forward." The 76ers will look forward, and they will try to "finish this thing off," and they'll do so with the ingredients that Hinkie put together over the last three years. To some degree, that's sad — after holding on for this long, it would've been nice to see the Sixers' owners stick it out long enough to see what the finished product would be — but it's also the risk Hinkie took when he set on a path almost entirely defined by risk. If the tomorrow you promise too long in coming, you might not be the one who gets to reap the reward.